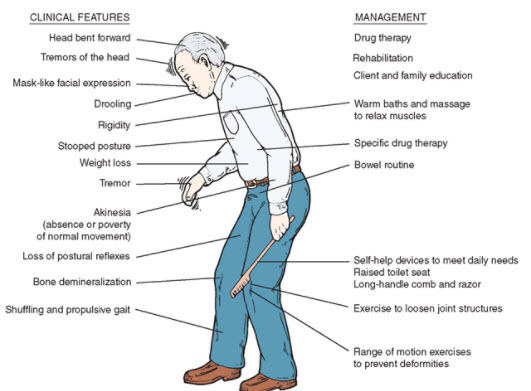 Parkinson’s disease is a brain disorder that causes a gradual loss of muscle control. Symptoms include tremors, stiffness, slowed body movements, and poor balance. As symptoms get worse, people with the disease may have trouble walking, talking, or doing simple tasks. They may also have problems such as depression, sleep problems, or trouble chewing, swallowing, or speaking. While Parkinson’s can be a frightening diagnosis, life expectancy is about the same as for people without the disease. For some people, symptoms evolve slowly over 20 years. Early treatment can provide years that are virtually symptom-free. About 5% to 10% of cases occur before age 50. For example, Boxer Muhammad Ali at age 42 and actor Michael J. Fox at age 30. The average age that people get Parkinson’s 62, but people over 60 have only a 2% to 4% chance of getting the disease. Having a family member with PD slightly increases your risk. Men are more likely to have Parkinson’s than women. A small area in the brain stem called the substantia nigra controls movement. In Parkinson’s disease, cells in the substantia nigra stop making dopamine, a brain chemical that helps nerve cells communicate. As these dopamine-making cells die, the brain does not receive the necessary messages about how and when to move. Parkinson’s is progressive, which means changes continue inside the brain over time. Doctors measure the stages by a careful assessment of your symptoms. The Hoehn and Yahr Scale is one common tool that looks at the severity of symptoms.The Unified Parkinson Disease Rating Scale evaluates mental clarity and function, behavior and mood, activities of daily living, and movement. Staging can help determine the best treatment. Levodopa (L-dopa) is a drug that the brain converts into dopamine. It’s been used since the 1970s and is still the most effective Parkinson’s medication. Eventually, levodopa can wear off quickly. It should not be taken with a high-protein diet. Levodopa is most commonly combined with carbidopa to prevent nausea and vomiting, allowing more levodopa to get to the brain. Other side effects include drowsiness. Hallucinations, paranoia, and involuntary movements may happen with long-term use. Drugs that mimic dopamine, called dopamine agonists, may be used to delay the movement-related symptoms of Parkinson’s. They include Apokyn, Mirapex, Parlodel, the skin patch Neupro, and Requip. Apokyn, an injectable, may be used when the effects of levodopa begin to wear off. Side effects include nausea and vomiting, drowsiness, fluid retention, and psychosis. Comtan and Tasmar can improve the effectiveness of levodopa, with a possible side effect of diarrhea. Patients on Tasmar need regular monitoring of their liver. Stalevo combines levodopa, carbidopa, and entacapone (the drug in Comtan). Azilect, Eldepryl, Emsam, and Zelapar, which slow the breakdown of dopamine, may be prescribed early in the disease or used along with levodopa. They should not be used with certain antidepressants. Electrodes can be implanted into one of three areas of the brain, and a pulse generator goes in the chest near the collarbone. Electric pulses stimulate the brain to help reduce a patient’s rigidity and tremors. However, It doesn’t stop the progression of Parkinson’s or affect other symptoms. Moreover, not everyone is a good candidate for this surgery. It’s important to have a well-balanced diet, with calcium and vitamin D for bone strength. Although protein can interfere with levodopa, you can avoid the problem by taking the medicine about a half-hour before mealtime. If you have nausea, take your medicine with crackers or ginger ale. Eating a high-fiber diet with lots of fluids can prevent constipation. Exercise may have a protective effect by helping the brain to use dopamine more effectively. It also helps improve coordination, balance, gait, and tremor. For the best effect, you should exercise consistently and as intensely as you can, preferably three to four times a week for an hour. Working out on a treadmill or biking have been shown to have a benefit. In addition, Tai chi and yoga may help with balance and flexibility.